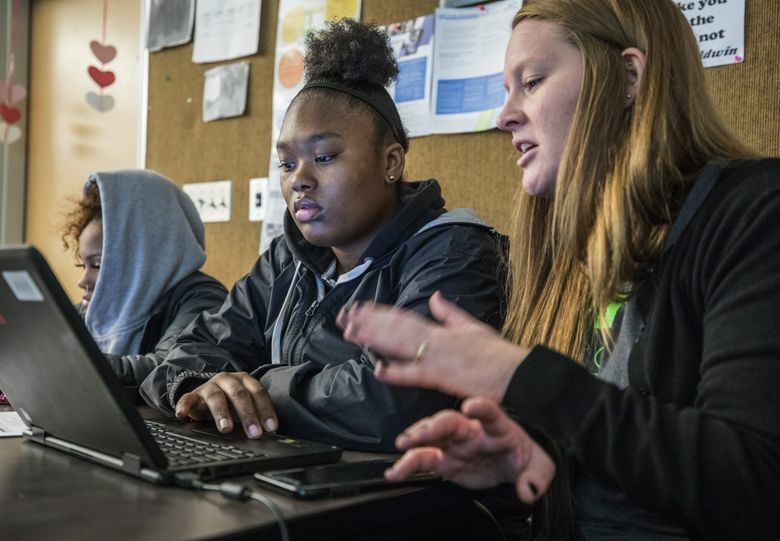 During school hours, Cleveland STEM High School in South Seattle gives help to every graduating senior to finish financial aid and college application forms, and the strategy is paying off. Last year in Washington, only about half of all graduating high-school seniors filled out the federal paperwork that is the key to unlocking financial aid for college. It was one of the worst rates in the country, and it mattered because students who apply for financial aid are much more likely to go to college. But Seattle’s public high schools are doing much better than the state average. That might be because students here have an additional incentive: For the past few years, graduates of a handful of Seattle’s high schools were guaranteed a free year of community college, so long as they filled out the paperwork and met certain deadlines. Now that deal is even better. 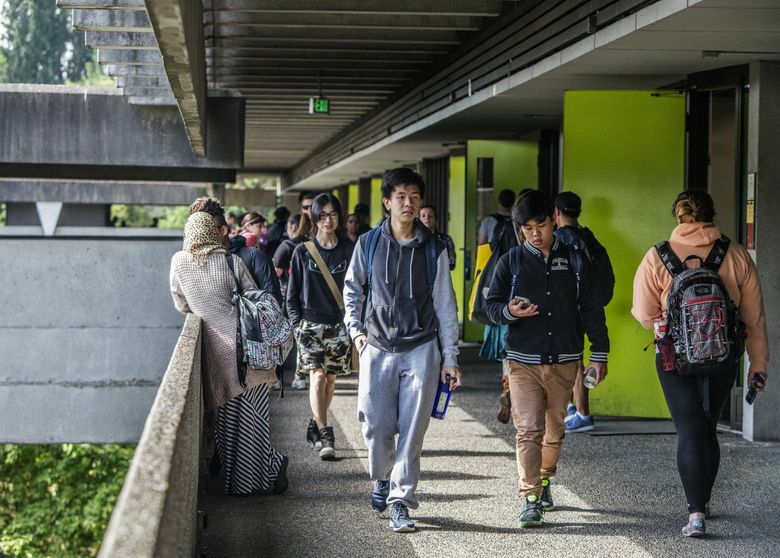 In November, Seattle voters overwhelmingly approved an education levy that gives two years of community college tuition-free for all students who graduate from Seattle’s 17 public high schools. Experts say that with a guarantee of financial aid, students are better able to see the possibilities — and may realize college is within their reach after all. Last year, Cleveland STEM High School in South Seattle had one of the highest completion rates in the area. That’s no accident: Cleveland is using an intentional strategy to make sure every student is getting help during school hours to finish the necessary forms — paperwork that can so easily fall to the bottom of a student’s to-do list after the school bell rings. It’s a schoolwide approach that has made the difference. Last year, nearly 84 percent of Cleveland seniors successfully completed the Free Application for Federal Student Aid, or FAFSA — the form that unlocks college financial aid by gathering information about a family’s finances and determining how much aid or loan help a student can receive. Other schools that led the region are Big Picture School in Burien and The Center School in Seattle. 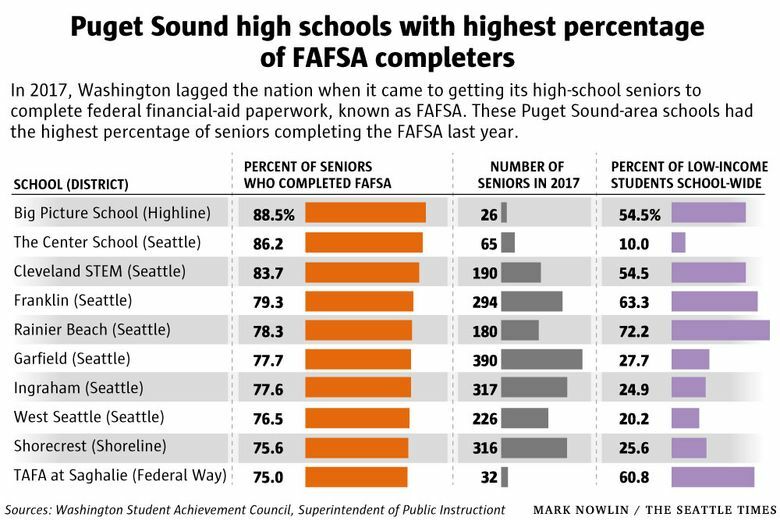 In general, most Seattle high schools turned in strong FAFSA completion numbers. How has Cleveland been so successful? “It’s not necessarily one thing, it’s a system and a group of people who have worked hard to build a culture and climate” that support college-going and financial-aid awareness, said Cleveland head counselor Avery Kamau. One day this month, Kamau helped students in a senior humanities class fill out some of the required paperwork, including the Seattle Promise scholarship application. She peered over their shoulders as they worked on their laptops, answering questions, trying to spot problems and giving gentle nods of encouragement. “You guys are awesome,” she said. Setting aside time in a high-school classroom makes it much more likely that the deadlines will be met, Kamau said. And the students at Cleveland were buzzing about the chance to complete two years of college tuition-free. “Once I saw that, I said, ‘I need to get on that,’ ” said Cleveland senior Miya Pasag, as she worked on the Seattle Promise application. Although she wants to go to a four-year school, Pasag is not sure she’s academically ready for it. And she says her family would have a hard time coming up with the money. Nationwide, students leave $24 billion in financial aid on the table by failing to claim it, said Kim Cook, executive director of the National College Access Network (NCAN), a Washington, D.C., nonprofit that works to help more students go to college. Murray’s office estimates that Washington’s share of that left-behind aid could be as much as $50 million. Only about 46 percent of Washington seniors completed the FAFSA in 2017, NCAN’s numbers show. The Washington Student Achievement Council’s own FAFSA tracker data show slightly higher completion rates in 2017 — about 56 percent of all students — but still below average when compared to other states. Of those who complete the FAFSA, 90 percent enroll in college, according to NCAN. Paradoxically, students in high-poverty schools typically have the worst completion rates in the country — even though those are the students most likely to qualify for aid, NCAN says. Only about 55 percent of those who don’t complete the paperwork go to college. The FAFSA isn’t just for need-based aid — it’s often required by colleges and universities as part of the application process for academic scholarships. Last year, the college-access group began ranking the states with its FAFSA tracker to prompt some friendly competition, Cook said. In 2017-18, Tennessee — which offers free community college to all of its graduates — was the top state. This year, Louisiana is seeing the best year-over-year improvement after it made completing the FAFSA a graduation requirement. The FAFSA application opened Oct. 1, and by Thanksgiving about half of Cleveland’s 220 seniors had finished it. To further improve that number, a South Seattle College counselor works at Cleveland on Tuesdays and invites students to drop by his office at lunch to finish the work. Cleveland students called the Promise scholarship a good backup plan if they don’t get into their choice of a four-year school. And they noted that many kids at Cleveland may not fit the definition of low-income but aren’t high-income either. A little more than half of students at Cleveland qualified for free- and reduced-price lunch in May 2018. Cleveland senior Jaida Jahmid, who worked on her application during the humanities class, wants to go to Spelman College in Atlanta — one of the country’s approximately 100 historically black colleges and universities — to earn a nursing degree. Still, she sees the allure of staying close to home, at least for the first two years. “This Promise scholarship would help a lot, moneywise,” she said.